The 787 and F-15 are captured in the same photo during a stop on the Dream Tour in St. Louis. Boeing has commenced construction of its new 367,000 sq ft composites facility which will build parts for the new 777X, with delivery of the first plane expected in 2020. About 700 new jobs will be created for the 777X work and construction of the new facility should be completed in 2016. The 777X is Boeing’s newest family of twin-aisle airplanes that builds on the 777 – image courtesy of Boeing. The facility is an expansion of Boeing’s current tooling center at the site and will contain six autoclaves with work on 777X wing and empennage (the tail assembly) parts planned to start in 2017. Boeing’s St. Louis site, which marked its 75th anniversary this year, is renowned for military aircraft production. More than 12,000 fighter jets have been built there and the site is headquarters for the Boeing Defense, Space & Security business unit. Earlier this year, Boeing selected its Everett, Washington site as the location for another new composite wing center for the 777X program. In this wing center, Boeing will perform fabrication and assembly of the 777X’s composite wing. Additionally, Boeing will perform final assembly of the 777X in Everett. 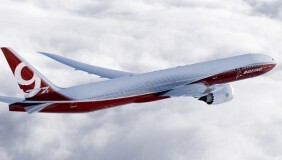 There will be two 777X models – the 777-8X, with approximately 350 seats and a range capability of more than 9,300 nautical miles; and the 777-9X, with approximately 400 seats and a range of more than 8,200 nautical miles. The 777X has 300 orders and commitments from six customers worldwide including Lufthansa, Etihad Airways, Emirates and Qatar. In addition to the St. Louis plant, Sweedish-based construction company, Skanska, has signed a contract worth $82m with Boeing to build their Commercial Airplane Decorative Paint Facility in Charleston, South Carolina. The project is a 35,000 square meter facility used to paint Boeing’s 787 aircraft. The facility includes two paint bays, office towers, and mechanical and electrical rooms.